Often when we say that Apple made news, it’s figurative, but at Monday’s Worldwide Developer Conference (WWDC) keynote, we can say that Apple literally unveiled News – a new app that will feed content from publishers into one personalized location on iOS devices. With the iOS 9 update coming this fall, iPhone and iPad users will be getting the new app on their devices, while Newsstand is removed. Newsstand was introduced in 2011 and represented a house for the apps created by news publishers. Apple’s move away from Newsstand and to News should represent a big opportunity for publishers both big and small. It has simultaneously both lowered the bar for entry to push content to iOS users and made new content potentially more discoverable for users. You no longer need to have developed an app to be browsed natively on iOS, in fact all you need now is an RSS feed. Also, Apple News will be using an algorithm to learn about the reading preferences of its users (akin to Amazon’s buying recommendations) and serving up new content in categories they like. So your blog about barbecues could organically be discovered by readers that have demonstrated interest in content about food and cooking, for example. 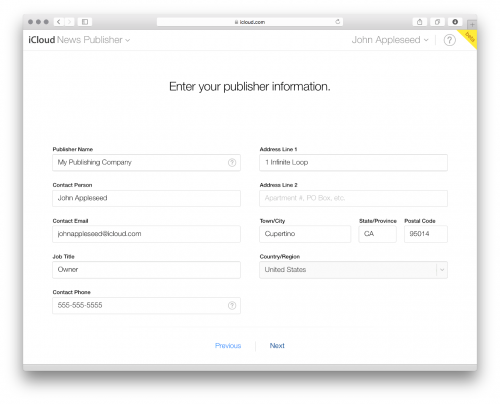 To make a submission to Apple News, you’ll need an iCloud account. Organizations will want to use an account that is tied to the company, not to an individual for this purpose. Once that’s decided, you log in and make your way through the sign-up steps in News Publisher. You’ll enter your publisher information on the screen below. You’ll proceed through a screen that asks you to name your channel and input your website. Your channel could be the same name as your web publication or it could be something specific to News. Apple says you can manage multiple channels if you like. For now publishers need to submit at least one RSS feed to their Apple News channel. You’ll need an RSS 2.0 feed to be compatible with Apple News. The good news is that if you use a content management system like WordPress to manage your blog, then RSS is already built into your website. Since this content delivery format (which stands for Really Simple Syndication) has been used for years to deliver content from publishers to popular apps like Flipboard and the now-defunct Google Reader, most blogs already support it. Publishers will be able to set up sections in their channel, and each section can be fed by multiple RSS feeds. Each RSS feed should have a title, link, and description element defined. Apple recommends that you use long-form RSS, so the entire content of the article is delivered, but it will support short-term format as well. You’ll need a typeface-based logo (i.e. a logo with your blog’s name in it) to upload, or you’ll get a default logo with your name. Apple has some rules about what is not allowed in your article content. It doesn’t want you to include social media links or buttons, because sharing options are built into the app. It also doesn’t want you to link out to related articles because there’s a built-in Related Stories option that will show other content from your channel and other publications. You also shouldn’t provide a link to the original story on your website, or include any boilerplate footer links. We just learned about this on Monday. Apple News Format will allow publishers to customize the look of their content for the News app. So instead of a default template, your content will be displayed with your own typeface, background, and other styles. We’re still waiting on the documentation to be released for this, but you could imagine that it will look something like HTML or CSS. Apple says that you will be able to connect your content management systems to Apple News Format, so there will be a way to automate your customized content in this way too. If you want to see metrics on how the audience is interacting with your content on News, you’ll need to use this. Signing up today will put you on the notification list when documentation becomes available. Having your content on News could lead to more revenue opportunities for your content. Apple says publishers will be able to keep 100 per cent of the revenue off ads they sell and are delivered in News. Also, you can use the iAd platform to have Apple sell ads on your content for you, and keep 70 per cent of that revenue.